Want to see daily self-care in action? A morning self-care routine can make all the difference in how your day unfolds. 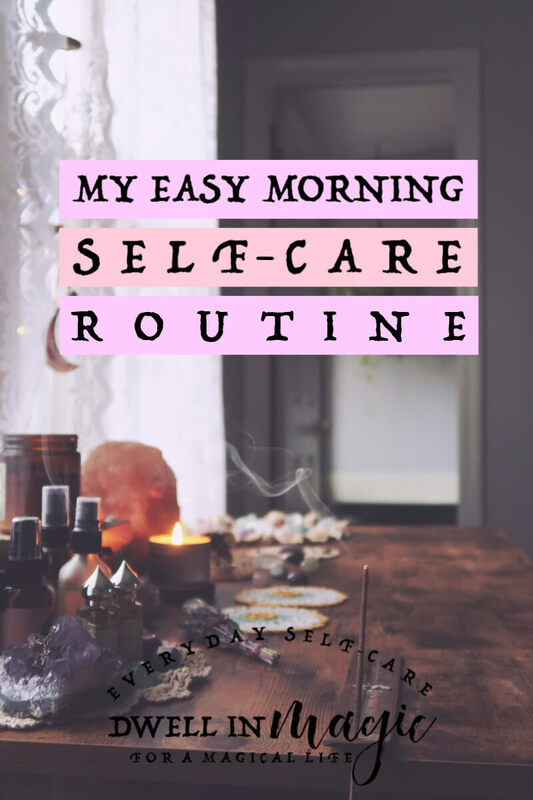 In this article I’m going to share my morning self-care routine and show you how easy and simple, yet powerful and transformative it can be. I’m pretty religious about my morning self-care routine. My nightly self-care routine helps me unwind and de-stimulate, and my morning routine helps set my mood for the entire day. I don’t consider myself a morning person, which really only makes my morning self-care routine all the more crucial–I take it seriously because I love feeling calm, relaxed, and centered. It also helps to feel like I’m ahead of the day so that annoyances and irritations don’t get to me like they would if I wasn’t feeling grounded. If you’d like to see snippets of my morning routine in action, follow me on Instagram and watch for my Insta stories. I frequently share my morning routine over there! I have two kids, four and six years old, and they wake up early. So the night before, I cut up fruit for them and put it on a low shelf in the fridge, alongside other snacks and I keep breakfast bars in the pantry for them. This way, I’m not bombarded first thing in the morning with two hungry kids. Is there anything you do in the mornings that could be prepared for the night before so that you don’t feel overwhelmed and rushed in the morning? This is really, really big for me. Since I’m not a morning person, it’s easy for me to roll over and grab my phone so I can scroll mindlessly through Facebook while I wake up. This starts me off on the wrong foot for so many reasons. When I make the choice to scroll mindlessly through Facebook or Instagram or any other social media network, I allow the energy of others to affect my own energy before my day has even started. Checking emails or work related stats can also cause me to feel overwhelmed and hurried before I’ve gotten out of bed. And the constant scrolling can even give me a slight headache. There are just no positive benefits of checking my phone first thing in the morning, so I choose to ignore my phone for at least an hour or two. The longer I stay off social media in general, the better my days are. I love to burn incense. Every time I burn it, I’m doing self-care activities so the scent has become even more sacred to me. As soon as I smell it, it instantly calms me and puts me in the mood for self-care. I also love essential oil diffusers and candles, anything to make my space smell more relaxing. I’m a huge believer in the power of aromatherapy. I keep lots of essential oil sprays and roll-ons on my nightstand and will frequently reapply them throughout the day when I need a pick-me-up. Coffee is what I look forward to in the morning. Whatever it is for you, make it a quiet, mindful practice every morning. Buy the best ingredients and really savor it. It could be green tea, a smoothie, eggs and toast. 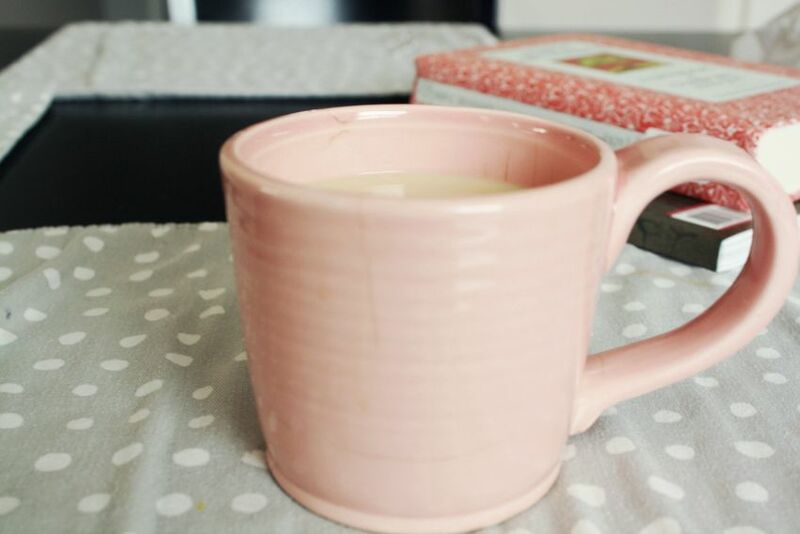 I love to buy cute coffee mugs just to make my morning a little brighter. It’s just one more thing that helps me look forward to mornings, which is good because I’m a night owl and morning isn’t my prime shining time! 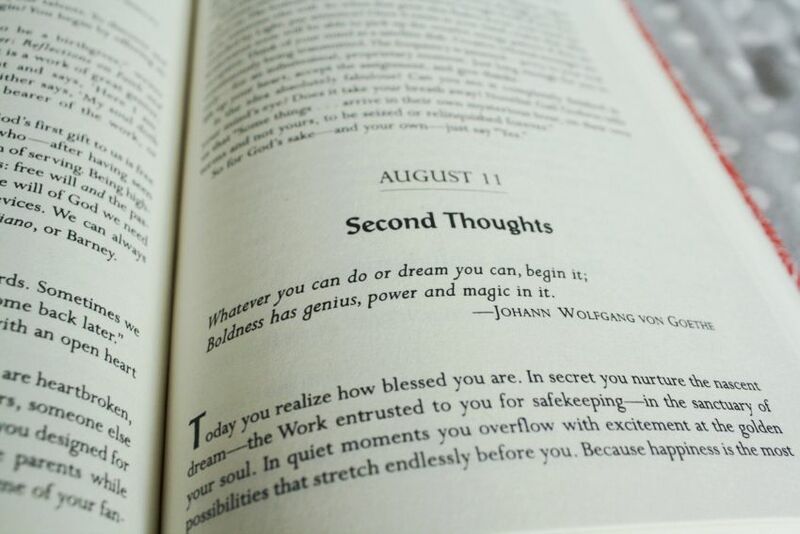 I love reading a few pages out of inspiring books every morning. One of the books I like to read out of daily is Simple Abundance. Another favorite read in the morning is Bella Grace Magazine. It’s a magazine but I love it because they totally embody the spirit of sacred self-care. You can also check out my post on my favorite daily books for self-care if you want to see my book rotation. Every morning I fill out a morning worksheet. These have honestly transformed my mornings because they’re quick but powerful. Sometimes I may not have time to do anything else, but I always have time to fill out a morning worksheet. They make such a difference. There are several worksheet bundles to choose from that have a morning worksheet, so it really depends on what your needs and intentions are. I alternate between all of them. The last thing I like to do is yoga or simple stretching. There are a ton of great videos on YouTube to follow along with but this one is my favorite yoga channel. What I love about yoga is that it’s so much more than just a physical exercise. It really helps you connect with that inner, still part of yourself. Even so, when I don’t have time for yoga or simply don’t feel like it–I’ll skip it. And I don’t beat myself up about it! Try to avoid perfection when it comes to any self-care routine. Even one activity from the above list will shift your day positively. The goal is simply to connect with yourself on some level. And that’s my morning self-care routine. It takes about 30 minutes and transforms my whole day. Do you have a morning routine and if so, what do you include in yours? If you’d like more sacred self-care inspiration, connect with me on Instagram where I share my morning self-care routine on Insta stories. 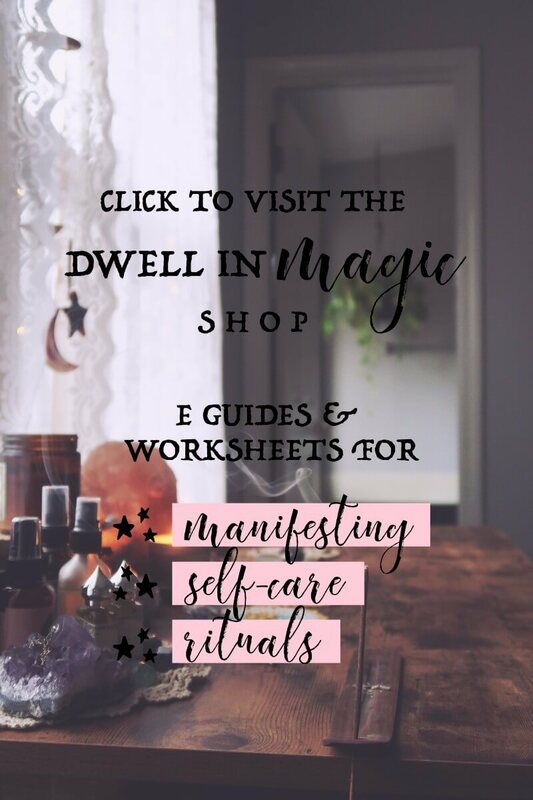 If you’d like to stay updated on new self-care blog posts, you can sign up for the Dwell in Magic weekly newsletter, which I send out on Sundays. Jessica Dimas is the author of Sacred Self-Care for Moms. Connect with her on Facebook and Instagram for more inspiration and updates. 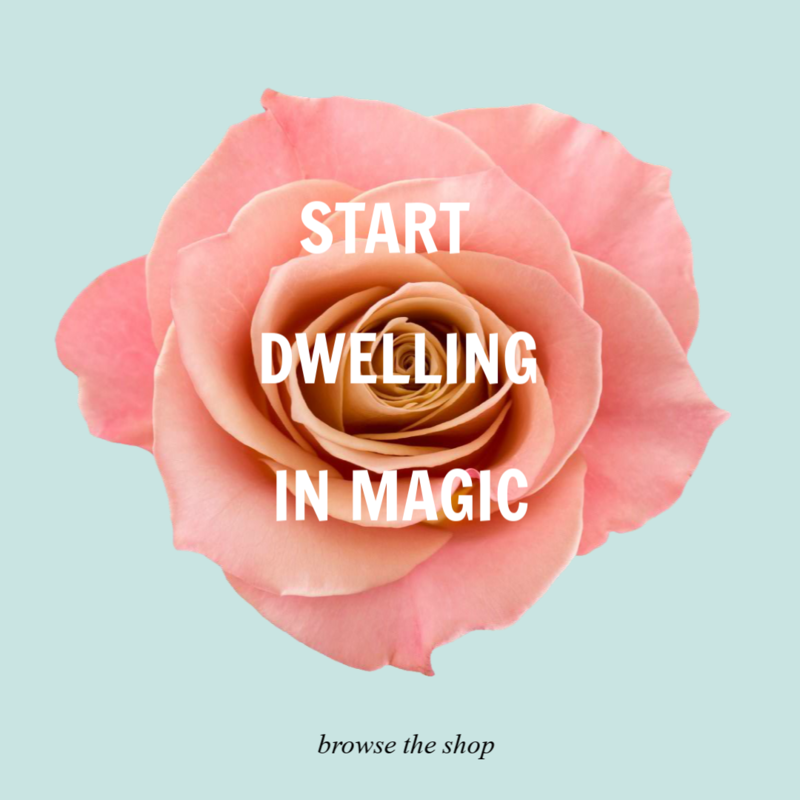 I'm Jessica, the creator and author behind Dwell in Magic. My passion is sharing my love for the power of sacred self-care and the art of manifestation. When the two are combined, life is ABSOLUTELY magical. Hi Jessica, Thanks for your awesome post! I am learning that a morning routine is crucial for my happiness and well-being through out the day. I have four children, so I always have to be determined and creative in the mornings if I want my time. They are normally up before me (my oldest is 9) and they can help themselves to a banana and a glass of milk. As soon as I am awake express gratitude before I even get out of bed. When I get up my children watch their favorite shows on YouTube and I have my coffee and a fifteen minute meditation (headphones!). I am often interrupted by my 2 year old and I find that if it’s not working out then don’t force it. I love being outside first thing in the morning. I usually take a little walk around my yard and talk to my favorite plants, express more gratitude to the universe and give myself a little pep talk for the day. That’s about it. It takes me about an hour too and it’s well worth it. I have to change it up every few weeks to make it work for me and my kids, so it never gets boring! Hey Jessica! I couldn’t agree more with you about the morning routine being crucial. I loved reading your morning routine, and I especially loved the part about you walking around your yard talking to the plants and expressing gratitude, that is a great idea I think I’m going to add to my routine too. Yes, my youngest is 3 and like you said, if it’s just not working out I don’t force it because that will definitely not start my day off right. You sort of sound like a kindred mom spirit to me! Our kids get up before us and we do our little self-care morning routine amidst some little kid interruptions and whatnot. Thank you for your comment, it was a pleasure to read! Thanks Jessica! I think we probably have a lot in common (did I mention that I home school too?). I really enjoy reading your blog and I’m looking forward to watching it grow. Perhaps one day I will have the courage to do something similar. No you didn’t mention that you homeschool and now I sort of want to stalk you a little bit, haha! I’m just envisioning another homeschool mama out there in the world doing her morning routine with her little kiddies in the background like me. If you ever have questions about starting a blog, email me! This is awesome! Some mornings I am able to get things done for myself before I have to get the kids up, and when I do I feel a lot better! Also, I LOVE THAT MUG! So cute! Yes, it’s so nice when you’re able to get some things done for yourself! I got that mug in the Target $3 aisle, I love that section of Target haha. This was a really great post! I’m trying to do better on not touching my phone until after I’m fully awake and already out of bed. Thanks for the inspiration and also the motivation to start doing yoga. Hi Amy! Yessss, not touching the phone helps so much. I succumb some mornings and check it while still in bed and I can literally always tell what a difference it makes, my mood is just off. Thank you for your comment! Thank you, Jessica! I really love some of your articles. I like this one. Love this routine Jessica! I need to stop waking up to my phone. Sometimes it’s so difficult to convince myself to roll out of bed. Grabbing my phone is just my lazy way of waking up. But you’re so right. It’s puts other people as the first focus of your day. But my day should really start off being about ME. Thanks for the reminder to prioritize myself every morning! I love this! My mornings have been all over the place lately and I’ve been trying to brainstorm some better ways to start my day. These are some great ideas that I will be sure to keep in mind while I work out my own routine! I love when my mornings are intentional! I’ve actually been off my morning routine since I went on vacation a few weeks ago and I’m DESPERATE to get back to it, it makes such a difference! I just found this beautiful magazine. I want all of them. They are all you say about them. Thank you! Aren’t they beautiful?! I’m trying to collect them all, and they’re perfect to read over and over again. This sounds great! I also have your nightly routine bookmarked to incorporate. It’s crazy how little changes such as these can really set you on the right path for the day. I’m trying to be more intentional about how I use my time throughout the day to ensure that I can slow down in the beginning and the end of my day. Thanks so much for sharing. Good stuff!! I really enjoy your morning routine, very nice way to start out your day especially with young kids. I have a similar routine myself that revolves around my morning coffee. It has really helped make me a much more positive person all day long. 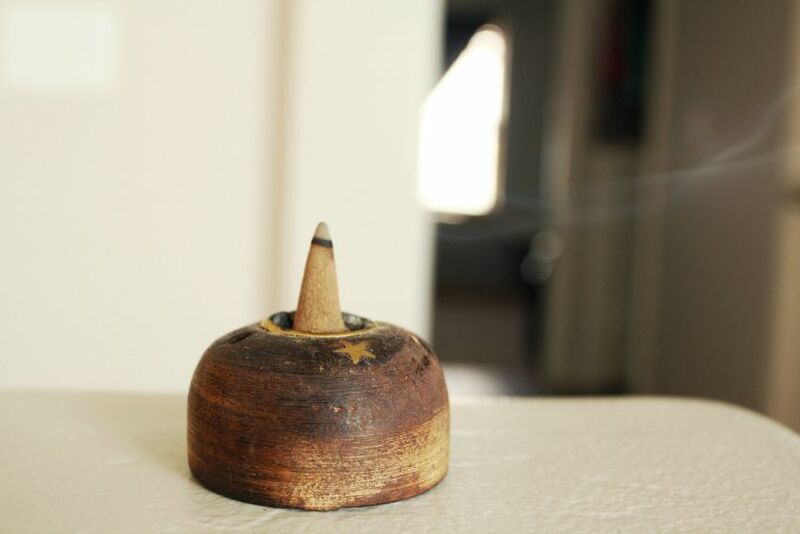 I really like that you use incense as well, I started doing that when I was in my early 20’s and have never stopped. The one thing I have never tried is yoga, I have always wanted to but have not actually done it yet, seems like it would fit right in to my day though. Well thank you so much for sharing your morning routine, I really enjoyed reading about it. I lOVE incense! It’s so soothing. And yes, any morning routine that revolves around coffee is bound to be a good one. Thanks for sharing a bit of your morning routine, I enjoyed reading it! Thank you so much for this post. I was scrolling through your relaxing playlist and listened to Daughters by John Mayer and just had quite the tearful release even though I’ve heard that song a million times–I’m sure the energy of your words on your site were the catalyst. Self-care is probably one of my favorite reasons for incarnating here, I didn’t realize it until I stumbled across this page tonight. So thank you for leading me there-what a wonderful thought and feeling. I can sense you’re a person who definitely walks their talk. Right on. Isn’t that song so good? It makes me choke up every time I listen to it, even though I’ve also heard it a million times. I’m so glad you found yourself here on my blog and I definitely believe we find things we’re meant to connect with <3 Loved reading your comment, thank you for sharing your thoughts. Nooooo, what did I do! Okay I’m gonna edit and re-link to my yoga playlist. I’m totally obsessed with this one yoga teacher on YouTube, she’s so awesome and she just finished filming a 30 day yoga for happiness challenge for the new year! What is a good scent of insense to use? Sorry this response is so late! My favorite is peppermint, because it’s really refreshing and effective at de-stressing you. However I am going through difficulties with your RSS. I don’t understand the reason why I can’t subscribe to it. This is a fantastic list! I especially like the staying off of social media in the morning. It gets me off of the wrong foot. Thanks for sharing! Thank you for this! I really connected with this. I always want to get a morning routine down, I mean, I wake up a 5a.m. I should have one right? I think I have a picture in my head of what I want as a morning routine and when it doesn’t work out, I lose faith and flop on the couch. I just need to flow with my life and home. I need to stop trying to have someone else’s idea of a morning routine. I appreciate you and I look forward to reading your other works! I wake up in the morning and basically exercise first thing, which is great because I’m not a morning person at all so I like to avoid my phone too! Otherwise it’s way too easy to just get sucked in. Love this piece! Coffee is also part of my morning routine- it allows me the time to recharge and gather myself mentally while enjoying my favorite drink. Thanks for sharing your morning routine. I wrote about mine last year and nailing my evening routine and getting a good night’s sleep definitely effects my mornings. Great article! I totally agree with you on not checking the phone every mrning. It really helps a lot! Get self-care inspiration every Sunday afternoon! I have binge read so many of your posts in the last few days! I've been trying so hard to heal my soul, and I feel like you're introducing me to the tools and techniques to finally do that! Thank you so much! Hi Jessica. Hope you are well. I have just got your manifesting magic with the moon worksheet and I LOVE IT,THANK YOU. I have a dedicated album for sacred self-care & I'm posting a bunch of your blog posts and links in them because you are my absolute favourite!! I found you a couple of years ago and started with your "anything can be" bundle and I've been following you ever since and love your stuff Thank you for what you do and for sharing your knowledge with the world!!! Wow, is all I can say. Your blog made me realize that I am 100% an empath. It explains SO MUCH. I am in shock. I've been researching it for four hours now, and I'm just blown away with the answers and validation that I am experiencing. Everything is all making sense now thanks to you. THANK YOU. Hi Jessica, I have recently discovered your work and I love every word you write. I purchased the Self Care for moms and I am working towards setting up this sacred space and time in between the chaotic time I have currently being a full time working mother and also expecting my second baby in May. Thank you so very much for the gorgeous moon calendar! A lot of time and love went into it–hugely appreciated! Thank you!!!!!!! Just discovering your blog and loving it so much! I marveled at how full the moon looked last night and I am so happy you sent this reminder to act on it. Oh my gosh. I love you. Thank you for making everything so succinct. You have such a user friendly approach to all of this. I just downloaded your 7 day bootcamp. I cannot wait to start it tomorrow! Thank you for making it!!! Hi Jessica! Just wanted to write & say thank you for your 7 Day Bootcamp! I just love it and have implemented morning and evening self-care routines and maintained them for a few weeks. I also have Sacred Self-Care which I can't wait to dive into. Thank you for your blog and courses, they are just wonderful. I'm a new blogger and found your blog planner a couple weeks back. I instantly fell in love with it, it was everything I was looking for and more. I have a horrible habit of buying planners and never using them, until I bought this one. I always have it next to me when I blog and I'm constantly pulling it out to add things to it. If you don't have Jessica's Manifesting Magic with the Moon worksheets, I highly recommend you invest in them! They help me so much and are easy to follow!! Jessica, you're the first person that really inspired me to take care of myself. In 2016 I really wanted to do daily practices, but I never did it. Reading your words made me give it a try. Thank you so, so much for all of this. Jessica, I can't even begin to tell you how your book & exercises have been changing my life! Can't thank you enough!! it's been so eye opening for both my husband and I.
Hi Jessica, I've been following you for ages on Instagram and have more recently been finding your group so useful.. so thank you. I have purchased both the Anything Can Be bundle and the 7 Day Mini Manifesting Boot Camp. Both are so helpful in prompting me to write out my thoughts and to focus. The worksheets are beautiful, and they have become a calming ritual. I bookend my days with candles glowing and pen in hand. Hey Jessica! I have been following you for some time now. Your work is inspiring and resonates with me so much! Your posts on self care have influenced a lot of what I do now and helped me really get into intentional self care. I believe what you offer is so needed in today's world. Without Jessica's worksheets and the whole bundle that is, I would be so lost, unorganized & frustrated. She has created such an awesome platform for even the newbie like me just getting started. Thank you Jessica! Ahhhh LOVE this! You're so inspiring. 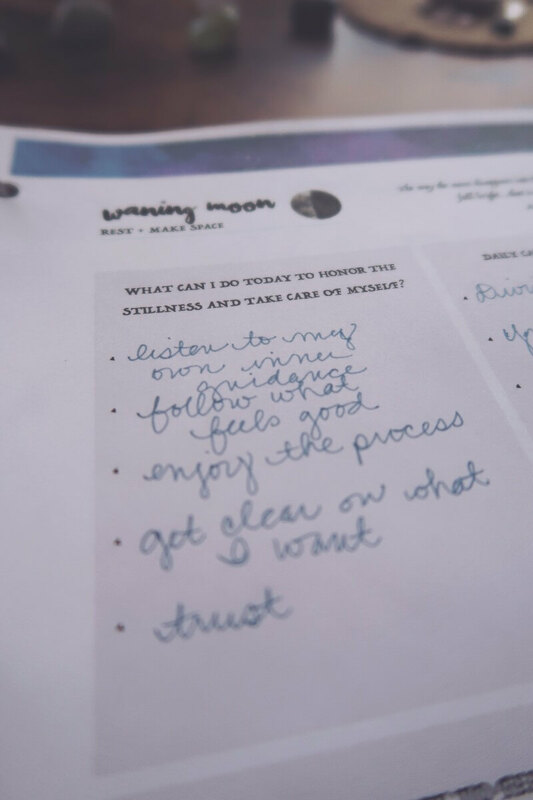 I just ordered your Moon Manifesting workbook last night and I'm really loving it from what I've seen, planning to dive in with the full moon worksheets Friday and moving forward! Super appreciate the amazing art and wisdom that you contribute! Keep rocking it, beautiful!! Your email today literally changed my life. Thanks for contributing such magical elements into my life. Omg the moon worksheets are my fav!!! A friend asked if it was a course and I was like it's a self-taught course but the pages are self-guided and I love it!! Hi love! I just wanted to say THANK YOU for your beautiful moon worksheets! I purchased it over the weekend and I am so excited to get into it!! Hey Jess :) been doing your worksheets and loving them! Hi, just wanted to tell you your blog is wonderful and in a span of 10 minutes gave me answers to two questions I had. Truly magical. Hi! I'm a hugggge fan, you are such an inspiration and a huge motivator! Thanks for being such an amazing person in today's world. Seriously your words are thoughts my mind craves!! Thank you for sharing your beautiful knowledge! Please know you're helping change my life for the better with your posts!!! Hi Jessica! I wanted to thank you for being so amazing. I have been struggling with panic and anxiety now for some time and have been trying to self heal with some of the strategies you use. I'm 10 days without a panic attack, I'm slowly getting there. Hello Jessica. I just wanted to let you know that your seven day mini manifesting boot camp has helped me a lot and I am only on day two! Hi! I first found you on Pinterest and from there started following your Instagram page. I truly appreciate your work that focuses on well-being of self & others. Also it gives peace and positive vibes. Keep shining and spreading the magic! Join the Dwell in Magic Facebook group! We have a monthly bookclub and talk about all things relating to everyday magic.